I have been fortunate to receive an advanced prototype copy of the upcoming game , “If I’m Going Down..” from Van Ryder Games. I do not profess to be a professional reviewer. In fact, this is my first review. Incredulously, I find myself writing a review for a game in a genre I really dislike: Zombies. Its seems it is a genre most people either love or hate. So despite my disdain of gore, I thought I would share my thoughts on the game because I have seen the game develop from an early stage to a well-crafted game, worthy of your consideration whether you enjoy zombies or not. For those of you unfamiliar with “If I‘m Going Down..”, this will serve as an introduction and a review. 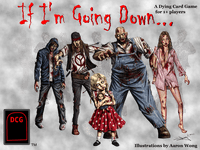 “If I’m Going Down…” is a one or two player (co-op) zombie-themed card game that is launching on Kickstarter. Its designer, AJ Porfirio, has dubbed it a Dying Card Game (DCG). Not that it is some kind of out of print card game, but rather that your character will die before the game is over. There is no chance of survival. Your characters fate is sealed, there is no glimmer of hope, its only a matter of how you live out your final hours before you succumb to the zombie horde. The pessimistic fatalism of this concept is fascinating to me. It reminds me of Ragnarok in Norse mythology; knowing your fate, and that your fate is death, but fighting on nonetheless. Now there are definitely no Vikings in IIGD but there are plenty of zombies! Waves and waves of zombies of different varieties and unique attributes unrelentingly close in on your doomed character. You must manage the limited resources you have available to take out as many can before you’re overrun by the undead. When playing IIGD you choose a scenario and a unique character. You start with a few resources (random or determined by the scenario/story). In each scenario your character is trapped in some way. Zombies will enter play from randomized draw piles at prescribed points as dictated by the particular scenario. Each turn, as zombies move closer toward your character, new zombies will enter play. You get 2 actions per turn to either manage your resources, search for new ones, or to use the resources you have. The resources may be weapons or other objects to help your cause. With two actions per turn, the turns move quickly and you must be judicious in how you use them. Weapons are either ranged or melee. In general, the weapons have a limited number of uses before they no longer function. They also have a power number and an APU (attacks per use) number. When you use a weapon (1 action) you target zombies and compare the weapons power plus any modifiers to the zombies “Z” number plus the range (distance to the zombie). You must also reveal the top card of the Fate Deck to see if your attack hits or misses. The zombie is killed if your weapons power is greater and if you do not reveal a “No Luck” card. This is a very efficient combat system allowing for quick turn resolution with just the right amount of chance. As the zombies move closer any zombie adjacent to your character can bite you if not held back. Two bites and its over. Now that you know a little about the game I will explain further why I think it’s a good game and one that you should consider (especially if you actually like zombies). There are a lot of different opinions on what makes a good game, and some may be more valid than others. Being an aspiring game designer myself, I’m going to reference a Wolfgang Kramer article on the subject that I try to keep in mind when I try and make a “good” game. Now some of these topics won’t actually apply to IIGD since it is a solo/co-op game. While the zombie genre is pretty saturated with games, IIGD brings some unique things to the table. The aforementioned Dying Card Game concept is foremost. The mechanics of the Fate deck is also fairly original. The Fate deck is used to find new resources and to help resolve combat with the zombies. The cards of the Fate deck have symbols which when revealed resolve whether the action is successful or not. To me this is a big improvement over dice rolling. IIGD has several things to inject freshness and replay-ability. For one, the game comes with two scenarios and multiple story-lines, with more to come. In fact, players are encouraged to create their own scenarios and story-lines. The game’s versatility and opportunity for enhancement and expansion is one of its greatest strengths. After playing, I couldn’t help but think of a few scenarios myself. The Storylines are a compelling way to add replay value. How you perform during the game determines how the story plays out. Sort of a game-driven choose-your-own-adventure. A great way surprise is injected into the game are the Occurrence cards. These are mixed into the Zombies decks. When revealed, they trigger events to occur (after a symbol draw from the Fate deck). These events force you to adapt to new circumstances, and are a very welcome addition to the game. These aspects don’t exactly apply in a solo or co-op game. That’s really up to how good you are at killing zombies! Though not likely, one player could die early during co-op, but the other player will die shortly enough. Then just play again. Not an issue in solo play. Turns move pretty quickly, in general. In playing numerous times, I’ve never felt the game was playing me. There are plenty of decisions to make, and those decisions have a direct impact. Of course there is some element of luck, but it never comes close to outweighing the decisions you have to make. The theme, mechanics and gameplay are well integrated and feel intuitive. Nothing seems pasted on. Everything complements the fact that you are in a zombie apocalypse and you are going to die. The copy of IIGD I received is of very good quality for a prototype. This will only get better for the real printing. The zombie character art is top notch. Each zombie has its own character and look. As a side note, I’m glad the dog-walker zombie won the fan vote. Clown’s are creepy enough without being zombie clowns. IIGD is by no means a heavy game, but neither is it super light. The rules are well written and easy to follow. IIGD is easy to learn and to understand. Using the right tactics at the right time takes some time to master however. I found IIGD to have a good balance between its complexity and the player’s influence. Its rules are fairly simple, straight-forward and intuitive while giving the player meaningful choices. I would say the game is more tactical than strategic but it never presumes to be otherwise. Appropriate to its complexity, the playing time is fairly short, 20-30 minutes (in my experience). Overall, “If I’m Going Down..” is a very solid and enjoyable tactical Zombie card game that is both versatile and satisfying. I definitely recommend you check it out and consider supporting it on Kickstarter. Thanks for reading.